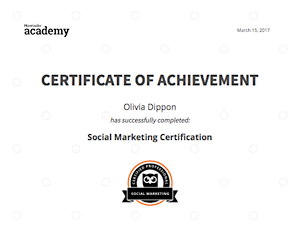 As an industry-recognized accreditation, the Hootsuite Social Marketing Certification demonstrates the recipient’s proficiency in social media marketing tactics and implementation. The certification coursework and exam include sections on optimizing social media profiles, social media strategy, growing online community, and content marketing. By passing the certification exam, the recipient demonstrates their ability to develop and execute a social media strategy, optimize social channels, and create social content that engages the target audience.